I remember my first moto jacket; it was faux leather, black with brass rivets and zippers. My friends at the time told me silver was cooler, but I wanted the brass to match my golden hair and my little gold Fiero! Anyway, flash forward a million years (oh okay, like 30) and a moto jacket is still a wardrobe staple and something I don’t think I’ve actually ever NOT had in my wardrobe since that first one so long ago. I have several motos in my wardrobe right now, but my absolute favorite is this Rosa Biker Jacket from Topshop (at Nordstrom). For a very affordable price, it looks and feels expensive! Motos are super versatile and will add a touch of edge to any look. I really can’t think of anything that a moto wouldn’t look good with …. jeans and sneakers, check … a pretty dress, check …. trousers, check …well you get the idea!! 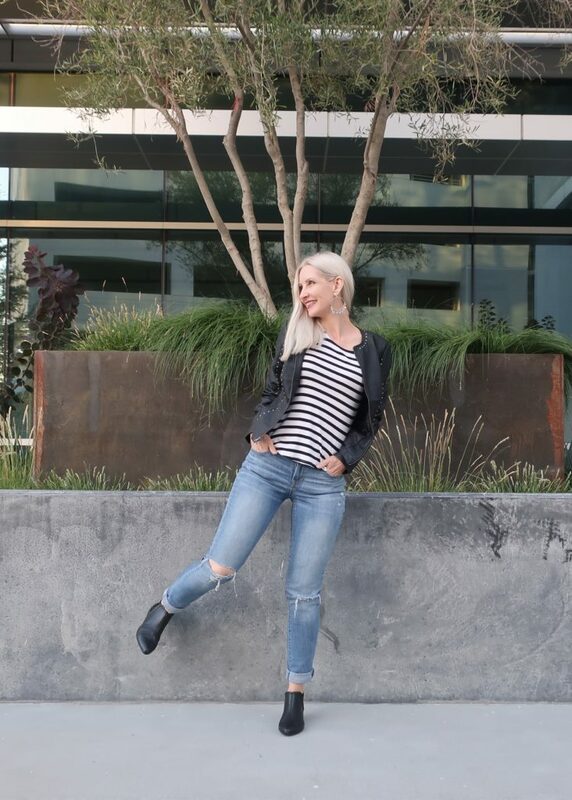 Wardrobe stylist, Kathrine Eldridge, is rocking the moto jacket with this cool casual OOTD. So, what do you think, Dolls? Is a moto jacket a wardrobe must have or no? Do you prefer your moto in basic black leather. or something else? Can you think of anything a moto wouldn’t look chic with? No really, I’m curious ….!! Can you? Leave me a comment! Want to see what else I’ve deemed a “wardrobe basic” …? You can navigate to all the posts from the menu on the top bar. Also on the blog this week, lots of comfortable wear-all-the-time basics including amazingly flattering and comfortable jeans and your fall/winter go-to bootie. And hey, psst … want new posts alerts and style advice and all around fun girly chit chat sent right to your inbox? You look great in your moto jackets! What fun outfits you have created with them. I have a few which are cold weather staples for me! I have two moto jackets but it’s so hot here I rarely get to wear them. I am keeping my eyes open for lighter weight jackets with the same styling. Love the jeans in the first picture! I love my black leather moto jacket and I’m hoping I’ll gwt to wear it some here in Florida. Thanks for all the great ways to style one. And no I can’t think of a way a moto wouldn’t look chic! Love the different looks that you can have with this gorgeous motto jacket, especially with the red dress and elegant looking shoes shoes. I can t live without! Happy weekend! I’ve got that jacket too. I got mine from Top Shop in Woking which is a grey 1950s town in the uk that war of the worlds was written in and based on. Interesting fact of the day. Thanks for the shout out Dawn Lucy! Love all your looks with the mot jacket. It’s a staple for sure. Thanks for the link up! I couldn’t agree more about the necessity of a collection of moto jackets! I am wearing one on the blog today as well. And I have about 10 in my closet but I am really needing a red one…and some plaid booties! You have a fabulous collection of moto jackets! I LOVE the burgundy one you linked to! Thanks for the linkup & have a great weekend! Love all the moto jackets, especially that black and white one at the end. That one’s really unique. love these moto jackets. I love the style and I think they go with everything. 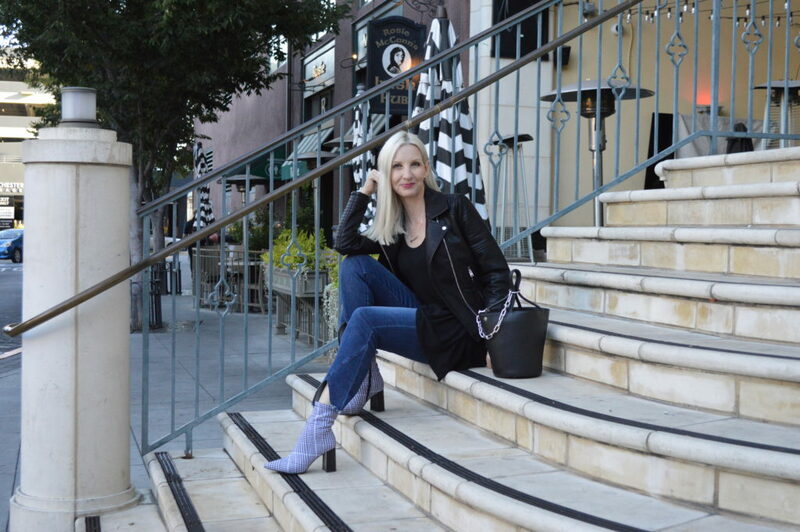 I love moto jackets too—they add just the right amount of edge to any look!